I put together a crew of friends for a little cruise on Saturday. I'm still shopping around and deciding on the new running rigging, but needed to burn through old diesel so a trip under power was needed anyway. The last time the boat had gone out, five months ago, it took an hour to start the engine so I was worried about whether it would start up easily or give me fits. I had poured some cetane enhancer in the fuel tank on Thursday to increase our chances of an easy start. Between the warm weather and the cetane enhancer the engine must have been happy and started up on the first try. The tide was going down and already rather low, so we pulled ourselves out of the slip with the lines and then off we went. 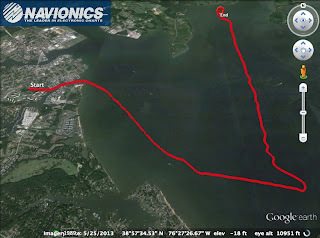 I set my Navionics chart app to record our track. The 5.7 nautical mile outbound trip took two hours. Here is our course in Google Earth. My phone was acting fritzy on the return, probably had overheated in the sun, so we used a friend's Polar Navy chart app and paper charts for the return trip. 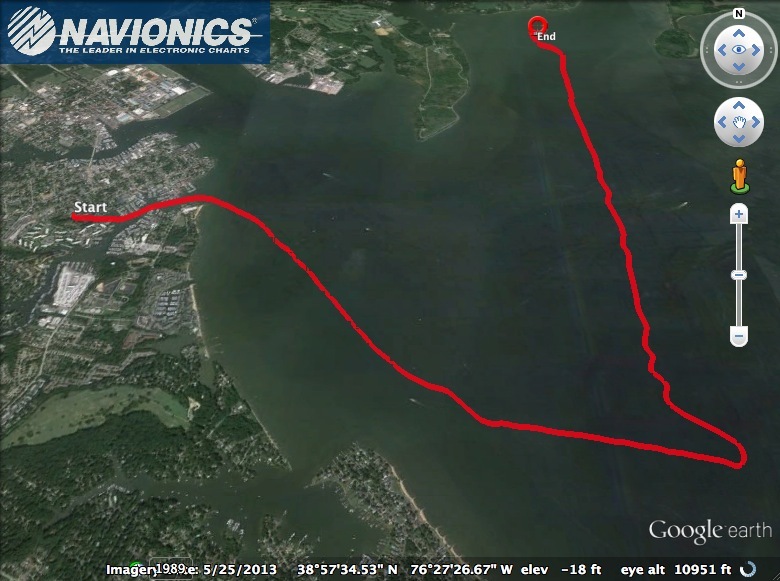 I like the Navionics but it is frustrating that it will only give me a North up display. A course up display is much more intuitive for me. I also wish it provided distance rings. The Polar Navy app showed two concentric circles, one about one nautical mile from our current location and another about two nautical miles out. The Polar Navy app seemed to work on my friend's iPhone, but when I bought the app it wouldn't even load the charts and there was absolutely no support provided by the developers, so I deleted the app and got a refund. I don't want to be overly dependent on a chart plotter, but it does make things so much easier. I went very slowly coming out of the creek. I get nervous around lots of other boats because I can't stop or turn on a dime and you never know whether other boaters are drunk, stupid, or both. But I am definitely getting a better sense of which boats are a concern on my course and which will pass well before our courses intersect. The pup dog is scared to walk on the decks when we are docked. She tends to put her nails out and instead of gaining traction she ice skates. But as soon as the lines are off, she forgets how scared she was and usually runs up and down the side decks to look at the water, birds, and the passing scenery. This trip was no different, but she did get a surprise when running up the port side deck and losing her footing as we got rocked by someone's wake. She apparently was splayed out and lucky not to have gone overboard. A friend went up and sat beside her and before too long she forgot about the stumble and had her sea legs again. It was a different story for the cats. Although the cats had been on short trips across Back Creek and out into the Severn River, they had never been out into the Bay. The boat was rocking a good deal from all the wake of passing powerboats on a busy day on the water. I heard Hunter crying (yelling at me, really). When we arrived at Whitehall Bay and I asked a friend to see how much anchor rode was in the anchor locker and whether it was tied to anything in the locker; he returned and let me know that the cats had puked and pooped all over. On the bed. On the settee. On the cabin sole. In the galley. The largest mess was a puddle of puke on the bed where one of the cats must have projectile vomited Exorcist-style. Whether it was all from Hunter or from Max, too, I still don't know how that much stuff came out of those small creatures. Max was actually cat-napping most of the time on the settee and didn't look stressed at all. Hunter, on the other hand, pretty much Velcro-ed himself to the cabin sole and didn't want to budge. Poor seasick kitty. I think he'll eventually get used to it. Fingers crossed. We anchored in Whitehall Bay for a few hours. I ceded the helm to Dave so I could go forward and get a lesson on anchoring from Phil. This was the first time dropping the hook on Ambrosia. Once the anchor was set we toasted with mimosas and then it was time for lunch. I brought an assortment of Mediterranean-style nibbles for our picnic afloat: grapes, nuts, stuffed grape leaves, Kalamata olives, mixed olives tossed with feta, fresh mozzarella, orzo with baby spinach, fusilli with olives and mozzarella, french bread, red sangria I had made, and a couple bottles of Santola vinho verde from Portugal. The trip out was cloudy and gray, and it looked like rain was coming. But somehow as soon as we anchored the skies were blue and the water was glassy. An afternoon of swimming, kayaking, fishing, and just relaxing aboard. Now I finally have some photographs of Ambrosia away from the dock. And, yes, we cruised along with my Cypress Adirondack chair on the bow. Navigating the crab pots that are scattered everywhere was a little more difficult at dusk, but we were treated to a beautiful sunset cruise home. I had wanted to handle the boat from start to finish, but in the tight and shallow quarters of my small marina, I just couldn't manage to back her into the slip. In theory it's a nice three-point turn and using a bow or spring line to pivot off a piling into the slip. But she doesn't handle as easily in reverse and I became too nervous about hitting adjacent boats, so I asked my friend Phil to help dock her. I was disappointed that I didn't do it myself, but docking takes a lot of practice and I otherwise handled her well for our cruise. A great day on the water with friends.